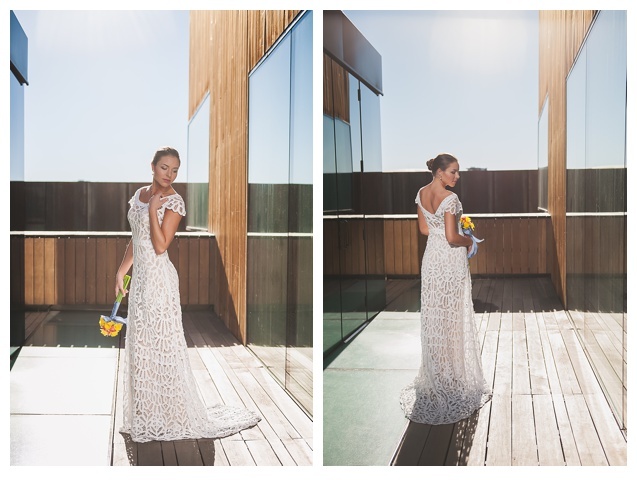 I recently had the opportunity to do this amazing styled dress shoot for the wonderful a&bé bridal shop. a&bé is an amazing boutique wedding dress shop supporting more of the indie and creative bridal designers. These dresses are a little more bohemian with a beautifully romantic feel. I LOVE this shop and the owners Anna and Breanna are so great! We chose The Museum of Contemporary Art as our backdrop for these gorgeous Rue De Seine gowns and what a great location. The rooftop terrace is stunning and would be a great location for a wedding ceremony and reception. Taylor MCA’s rental coordinator was so easy to work with it just made the entire shoot so laid back and chill! Our lovely model Katie really brought the dresses to life and the amazing Leilani Drum is responsible for the flawless hair and makeup. None of this could have looked so amazing if it were not for our great wardrobe stylist Emily Smoot, she styled every dress just perfect. Last but definitely not least the wonderful Plum Sage provided our gorgeous floral arrangements and just put the icing on the cake of this beautiful shoot. I will be showcasing this dress shoot in four parts just so I can show the amazing qualities of each dress! ENJOY!